Artist Judith Alder explores growth, change and evolution from the origins of life to the 21st century and beyond in her new project, Once in a Universe. Once in a Universe culminates in a two-week residency at DC1 Café Gallery from 24 September to 7 October 2018, when Judith will be working live in the gallery and developing new work informed by her research. Across Devonshire Collectives spaces will be a programme of performances, talks and an exhibition that look at identity, race and our relationship to the digital, investigating the possibilities offered by Afro-futurism, cybernetics, virtuality and the ideas of the trans and post-human. The programme will incorporate contemporary music making, video games and graphic novel making. A mermaid tells the story of Prince Fred who one day magically turned into a stinky, funny-looking crab.The Crab Prince makes lots of friends in the rock pools, many of them even funnier looking than he is. They have a great life together, making up games and having races. Then one day a little child called Sandy comes along and asks the Crab Prince for help. At last, the Crab Prince has a chance to break the spell. But something is wrong… he needs to get back to the rock pool and only you can help him. Devonshire Collective is running a pilot training programme to equip artists with the basic skills to work with the local community as community artists and educators. 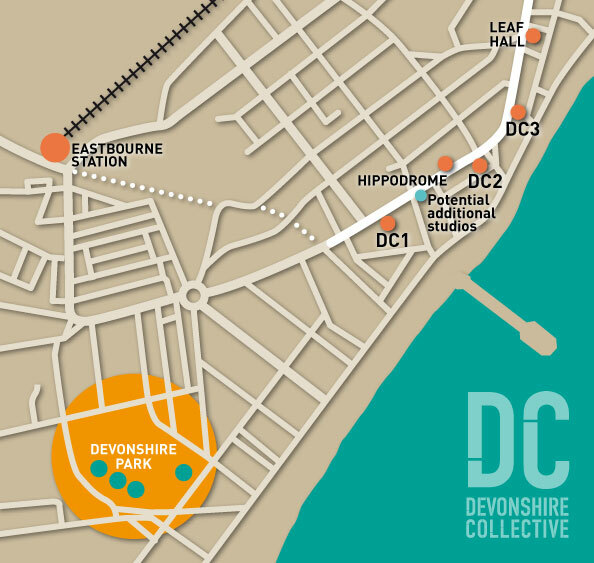 Devonshire Collective is pleased to launch a new art and gift shop at the DC1 Café & Gallery from June 2018. We are currently looking for high quality artist made products to stock. Devonshire Collective invites artists to participate in our inaugural Postcard Show. All submissions will be included in a vibrant exhibition of original artworks in a range of media to be displayed at DC3 Project Space, 1-5 Seaside, Eastbourne BN22 7NA during Eastbourne Artists Open Houses 2018 (7/8 April and 14/15 April).